Received my holster. Absolutely beautiful thank you and wish you continued success. Package made it here on Friday. Sitting in my deer stand now with it strapped to my chest as I am writing this. Love the product, very comfortable and barely notice it is there. It fit my Glock 40 perfect!! The new holster fits great! I sent the other holster off on Monday so you should be receiving it soon. Again thank you for the best customer service I have ever received! I will stay in touch thank you! Couldn’t be more happy! I have been a professional hunting and fishing guide in Alaska for 16 years. I never carried a pistol because of the inconvenience in the options to carry one. I wear a backpack 90% of the time hiking and climbing mountains, and a place to carry a pistol is just plain uncomfortable. 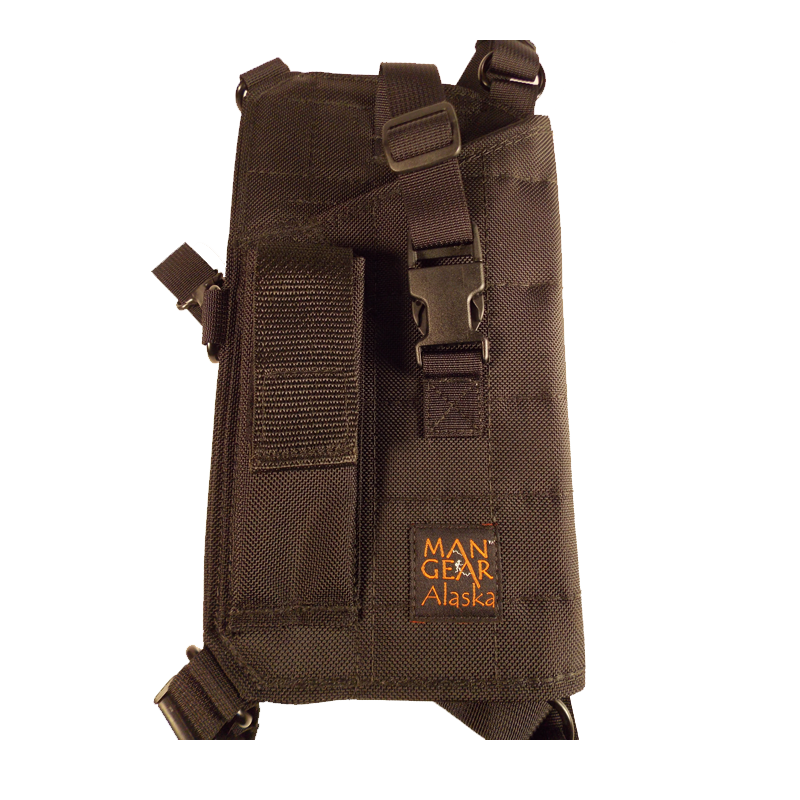 I purchased a Man Gear Alaska large auto chest holster for my Glock 20, and now I wear it religiously. Whether I have my pack on or just going to the creek to get water I am confident in its excellent accessibility to draw my weapon if needed. Rebecka, I wanted to write and tell you how much I am enjoying the revolver holster that I recently purchased from you. It is awesome! I wanted to actually use it before writing. We have spent the last two weekends putting up blinds, stands and doing all of the chores that you do for white tail hunting. I have worn the holster carrying a Smith and Wesson L frame in .357 magnum with a 4 inch barrel both weekends. While we do have bears, just not to the extent that you do, we do have plenty of copperheads and rattlesnakes. This is the 1st holster I have felt comfortable wearing for an extended period of time. it distributes the weight well to reduce fatigue, is accessible quickly if needed but stays out of the way when not. Quality is outstanding. It has been a pleasure doing business with you. I think your customer service and product both are outstanding. I'll be looking forward to making my next order. Holster received today. Perfect packaging. Nice handwriting Very reasonnable delivery time. 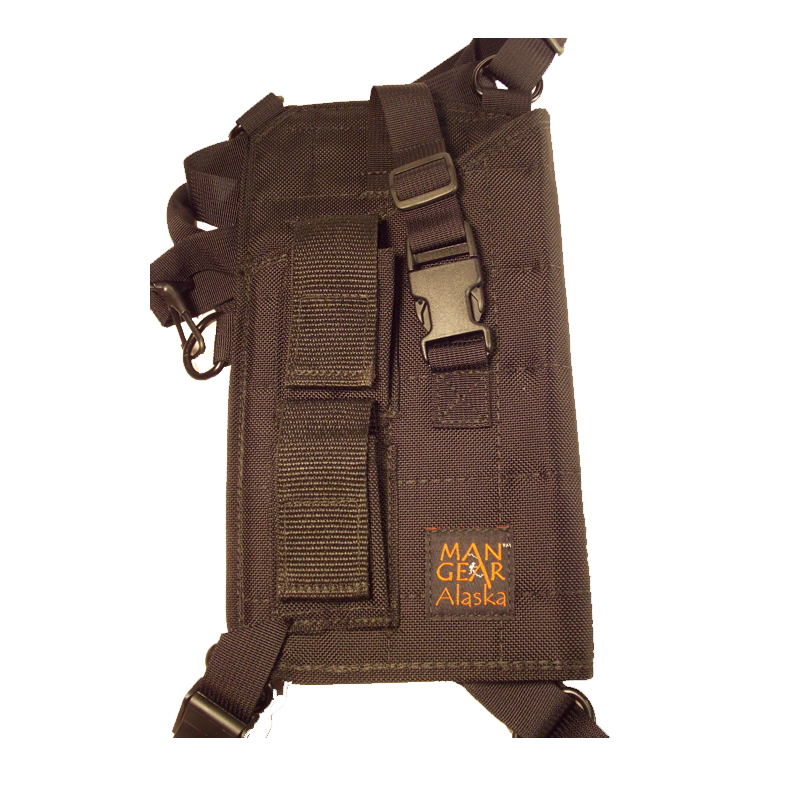 Fully adjustable holster. So practical ... my wife stole it from me I will re-order ASAP in few days another one. (Info: our Ruger Security Six 2' 3/4 fits the holster and surprisingly our Glock 17 and 21 SF also ! I received the holster last night. I think it will work great. Thank you again for all your help and outstanding customer service. Best holster in the world. I have finally found a true really functional holster for work in Alaska and riding, working or backpacking. In the last 40 plus years I have lives and worked in Alaska the true Last Frontier. We can be surprised sometimes by very Large Bears and many of our friends have lost their best friends to Brown Bear Attacks.I was out on the trail walking my dogs and having my S&W 460V in the holster on my chest is a very good feeling, if I were surprised by a bear we would at least have a chance to protect ourselves. I have been a professional hunting and fishing guide in Alaska more than 30 years. Carrying a handgun has always been a hassle. 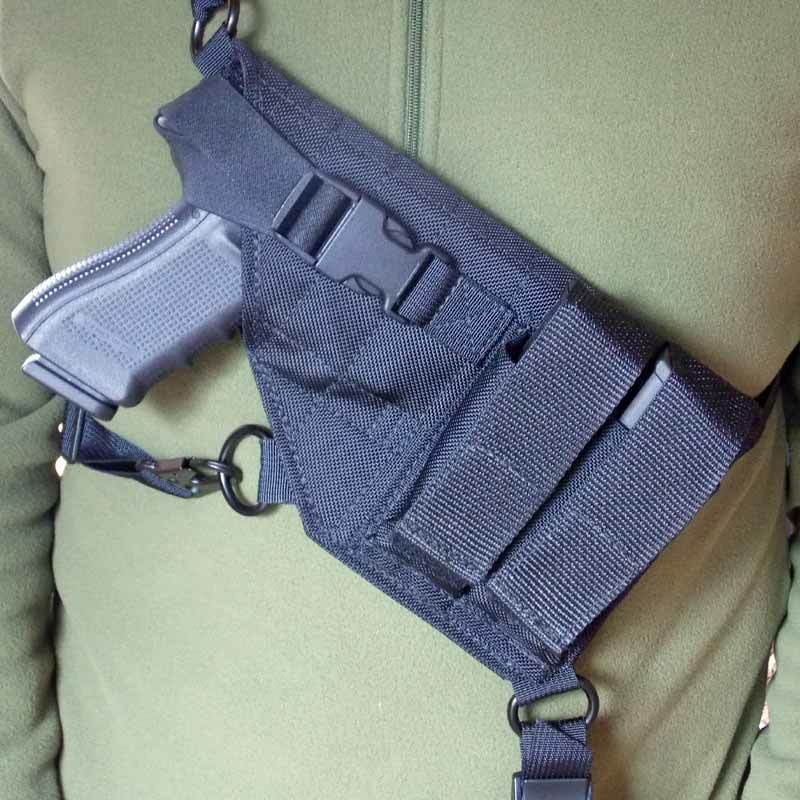 Hip holsters are a nuisance, shoulder rigs are hard to get to under a coat or with a backpack. 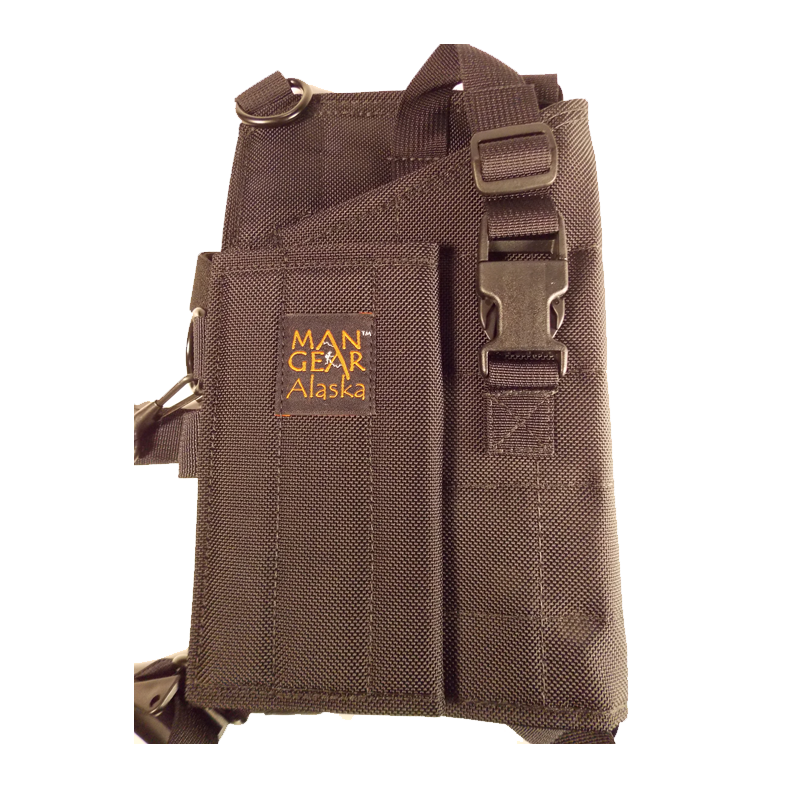 Once I found Man Gear Alaska chest holsters I found myself carrying; even my .500 S&W. Rebecka’s holsters are right there, readily accessible even when wearing a coat or your pack. Distribute the weight of heavy handguns. The quality is suberb, customer service excellent, made in Alaska by Alaskans that know what works. Had my Holster in 2 Days! Just wanted to thank you for having the exact product that I was looking for, for having free shipping in-state, and for the fastest delivery possible. Had my holster in 2 days! Very Nice! I really like your design. I would like to purchase your 1911 model holster with the 1 mag pouch in the left hand model. Thank you for offering this model. I think you will have a great market for this new model.